The Spiro Mounds were discovered in Oklahoma on the southern bank of the Arkansas River near Fort Smith, Arkansas. During the 1930s and ‘40s, archaeologists from the University of Oklahoma excavated various places at the site, revealing one of the greatest collections of ancient Native American artifacts in the United States. 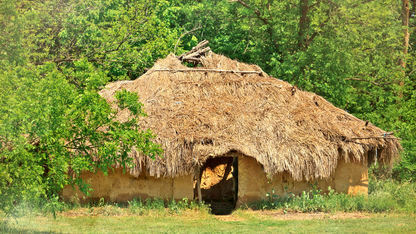 The site encompasses 12 mounds spread across 150 acres of Oklahoma land and reveals a distinctive Mississippian culture. Similar to other Mississippian prehistoric towns that have been discovered in the U.S., the Spiro Mounds include a large number of man-made earthen mounds and complex earthworks. Some of the more notable structures on the site include two temple mounds, nine house mounds and a burial mound. The entire site was planned and built around an impressive central plaza for political and religious gatherings. The Spiro Mounds were occupied from about 850 to 1450 A.D. Most historians believe that the ancient people who created the Spiro Mounds were Caddo Native Americans. However, from the 1870s, Choctaw and Chickasaw freedmen farmed the land within the complex. The Spiro Mounds, located in what is now Le Flore County, Oklahoma, are one of the most significant archeological discoveries in North America. The Oklahoma Historical Society opened the Spiro Mounds Archaeological Center in 1978, and it is the state of Oklahoma’s only archeological park. Visitors can learn more about the Spiro Mounds by visiting the site’s interpretive center, which includes an educational trail system.